SoftOrbits Photo Editor will tidy up your pictures by helping you select and remove unwanted objects, enhance photos automatically or under your supervision, sharpen up the details, leveling horizon and framing the picture just right. Turn your digital snapshot into a perfect postcard! Be it a passer-by, a hanging wire or just an unwanted shadow, you can make your picture free of distracting objects with ease. Remove unwanted objects in just a click! Our simple photo editor will help you selecting the whole object and re-create what's beneath it, producing a clean, perfect postcard free of blemishes and distractions. Clean up distractions in your photos with a click of a button! SoftOrbits Photo Editor perfects Smart Select, Smart Mask and Smart Background, enabling you to select and remove objects such as distracting shadows, power poles or simply random passers-by. You no longer need an expensive photo editing suite to turn your digital photos into masterpieces. SoftOrbits Photo Editor will tidy up your pictures by helping you select and remove unwanted objects, enhance photos automatically or under your supervision, sharpen up the details, leveling horizon and framing the picture just right. The tool is small and lightning fast. You'll be using it like a pro in no time, producing perfect shots one after another. 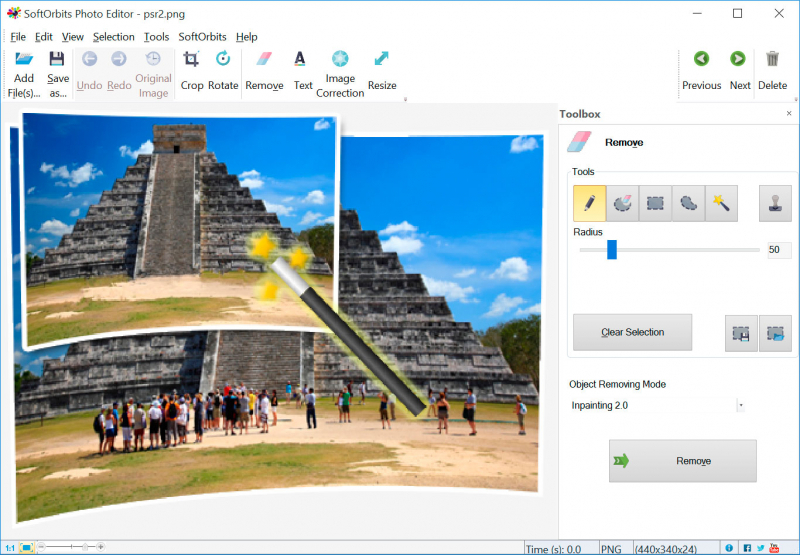 SoftOrbits Photo Editor is equipped with a fully featured toolbox of photo editing tools. With these easy tools, you can automatically fix small imperfections and correct the red eye effect, control brightness and contrast, adjust white balance, as well as frame, rotate, flip and frame pictures to achieve the best composition. How many times have you seen a blurred, overly compressed photo appear on your timeline? You can wave them goodbye with this simple photo editor! The tool can help you make your photo Web-ready by carefully choosing all the right resolution, sharpening and compression settings to produce files that look better on the Web than anything you've seen from your friends. Scan through your photo collection, and you'll likely see a host of pictures that are so close to each other they aren't worth keeping. SoftOrbits Photo Editor is equipped with a convenient file manager allowing you to navigate through your entire photo collection and delete duplicates in just a few clicks. © FileEagle.com. All rights reserved.